Baby Doe really existed, as did the other major characters in this opera, whose 1956 première took place in Central City, Colorado - territory that the real Baby Doe would have known. In 1880, she was a beautiful, intelligent woman who courted silver baron Horace Tabor, even though he already had a wife, the ascetic and thin-lipped Augusta. Although Baby Doe's initial motivation might have been access to Tabor's money, she came to love Tabor for more genuine reasons. Eventually Tabor left Augusta and married Baby Doe, but their relationship scandalized respectable society in Colorado and Washington, D.C. Political change and other bad luck in the last years of the nineteenth century caused Tabor's holdings in silver to fall apart. He died penniless in 1899. Baby Doe hung on for another 36 years, deeply devoted to his memory, and she, having become an eccentric old woman, finally froze to death in a poor cabin built on the site of the Matchless Mine, the site that had solidified Tabor's fortune. One of his ultimate wishes was that she never sell it, and she never did, hoping against hope that someday it would bring honor and wealth back to Tabor's name. Today, Baby Doe, Horace Tabor, and Augusta Tabor are legendary figures in Colorado history, and given their larger-than-life qualities, it is not surprising that someone wrote an opera about them. Composer Douglas Moore and librettist John Latouche did so on a commission by the Koussevitzky Foundation. And a good job they did. Latouche, who died shortly after the work's première, had a gift for finding words that were poetic yet always suitable for the characters who sang them. Similarly, Moore's music is simple but not naïve. Baby Doe is one of those scores that blurs the distinction between "musical comedy" and opera, and it's clearly an American opera, given Moore's frequent use of tunes that could be derived from folk music. He has included many genuine arias in this score, most of them for the title character, and if this conservative music is neither particularly innovative, original, nor even memorable, it's part of a synergy with the opera's other elements (libretto, cast, story, atmosphere) that works very well. Nevertheless, the raison d'etre for this recording's continued availability on LPs (first on MGM, later on Heliodor and Deutsche Grammophon) and now CDs is Beverly Sills, one of the most popular American sopranos of all time. Baby Doe was among her first big roles; she was not an unknown when she performed it at the New York City Opera, but she had been singing with the company for only three years when it was offered to her. On these discs, her voice is radiant, and her identification with the role seems complete. There's no Lucia-like coloratura for her to sink her teeth into; Baby Doe is for lyric sopranos, but Sills fits the bill nicely. Baritone Walter Cassel sang Tabor at the opera's première, and he repeats the role here, finding both the character's charisma and his fatal weakness. His sonorous voice reminds us that other successful roles for him were Scarpia and Jochanaan. Mezzo-soprano Frances Bible succeeds in making the thankless role of Augusta sympthetic; she excels in her moving Act Two aria, in which she agonizes over whether to offer financial support to the failing Tabor, in spite of everything that has passed between them. The dozens of supporting roles are cast from the New York City Opera company, and there's not a weak link. Everyone does his or her part to create a character, and everyone's diction is exemplary - one hardly needs a libretto. The booklet offers little information about conductor Buckley. He appears to have been one of the New York City Opera's house conductors, and he does a fine job moving and shaping Baby Doe. This recording is 40 years old, and it sounds like it. The sound is cramped, congested, and harsh, and I'm sure that there's nothing digital remastering could have done to fix it. It's listenable, but it requires some tolerance. Deutsche Grammophon's booklet contains the full text, historical background and an entertaining personal reminiscence by Sills. 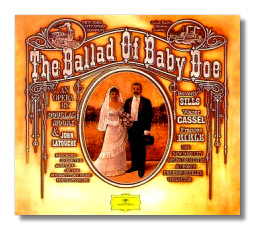 The Ballad of Baby Doe is essential for admirers of old-fashioned American opera, but most of the sales will be to people who still love Bubbles. And who can blame them?